The thyroid has many metabolic functions, like temperature regulation, heart rate, weight, reproduction, and many others. Obviously, it's an important component of your body. Your thyroid stimulating hormone (TSH), which is produced by your pituitary gland, tells your brain when more thyroid hormones (T3 and T4) need to be produced, similar to how a thermostat on your heating system adjusts up and down to maintain a specific room temperature. Patients suffering from low TSH usually have high T3/T4 hormone levels. Since having a low TSH level is usually associated with hyperthyroidism, which causes other symptoms, it's important to do everything you can to get your TSH levels back to normal and prevent it from dropping again. What does a Low TSH Mean? Your thyroid gland is producing too much of the thyroid hormone which signals to your brain to stop producing anymore. Individuals who suffer from low TSH levels and high levels of T3 and T4 (the thyroid hormones) have a condition that is commonly referred to as hyperthyroidism. However, if an individual suffers from low TSH levels AND low levels of thyroid hormones, then it could mean that the pituitary gland (which is responsible for producing thyroid) is weak from disease or damaged. This gland can become damaged if you've suffered from a serious head injury or, less commonly, if you have a tumor. Your pituitary gland doesn't just produce thyroid hormones -- it produces 8 different hormones. A simple blood test can be done to help determine if it is damaged by seeing the level of the other hormones in your body which it produces. Alternatively, some patients will need to have a brain image taken to ensure this condition is not a result of a tumor. Normal TSH levels are between 0.3 - 3.3 mIU/L (milli-international units / liter). Sometimes a low TSH level is a natural response by your body to fight hyperactive thyroid. If your TSH levels drop down to abnormal levels, your doctor can prescribe medication to bring it back up to normal, healthy levels. In some cases, your pituitary gland may fail to release more TSH even though your body is going through hypothyroidism. 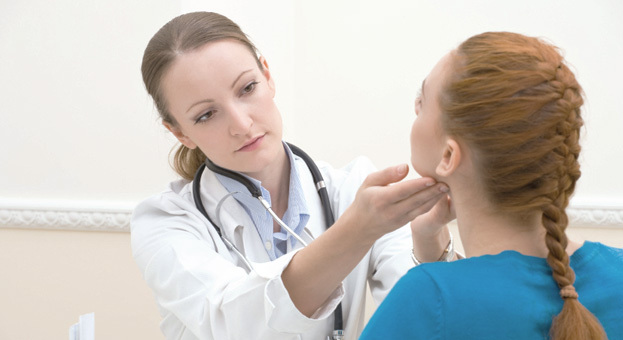 Patients who experience low TSH levels during hypothyroidism need to seek medical attention as a problem in the gland itself may be responsible or worse, a tumor in the head. The hypothalamus in your brain produces a hormone called thyrotropin--this controls your pituitary gland and the production of T3 and T4 which help stimulate your thyroid glands. The hypothalamus also produces a hormone called somatostatin which is basically an antagonist for the thyrotropin hormone. Since these two hormones can't interact harmoniously, imbalances occur. After consulting your doctor, you may be given a simple medication to increase your TSH levels. These drugs (like anti-thyroid drugs) work at slowing down thyroid activity so your body naturally starts producing TSH. Depending on how serious your condition is, and whether or not you are able to take anti-thyroid medications, your doctor may have to operate and surgically remove some part of the thyroid gland which has a high success rate for full recovery from low TSH. Regularly exercising can increase your TSH levels. Some great exercises include practicing yoga, meditation and performing breathing exercises daily. All of these help stimulate your pituitary gland. Overall, exercising regularly helps prevent a whole wide range of health complications and prevents hormonal imbalances. Your doctor may also recommend you to start eating a healthier diet. Iodine and selenium are very important in helping you maintain optimum TSH levels. Also, if you suffer from high or low blood sugar, you may be at greater risk of suffering from low TSH. A visit to your doctor can ensure with some medication and proper diet planning that you maintain your sugar levels so your glands can work properly. Sometimes, hormone replacement therapy can help get your TSH levels up to normal levels again. If you see any of the symptoms indicated above you should get your TSH levels checked and work with your doctor in changing your diet and lifestyle so that it doesn't happen again.